20-18 Women's Full-Contact - SJ Bulldogs FLAMES F.A. 20-14/18 Women's Full-Contact - SJ Olympian GODDESSES CR F.A. 20-18 Women's Full-Contact - PZ VALKIRIAS F.C. June 13th - Seminar: Road Map to Recruiting, with Jeff Johnson from Prep For Next Level, Mike Bobino from Student Athletes In Touch, and other professionals on the selected panel in the recruiting area. 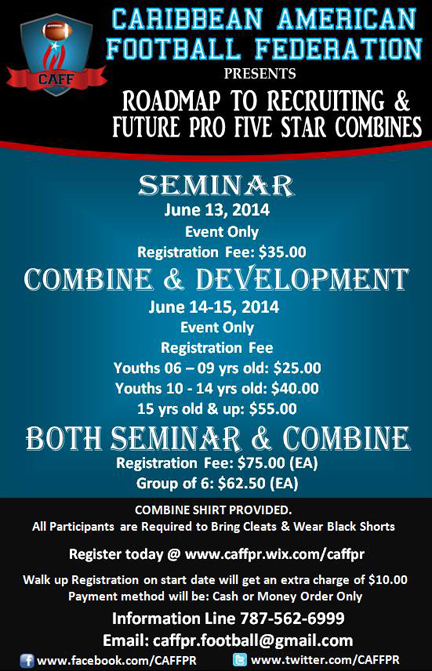 The seminar will be followed with Future Pro and their Future Pro Five Star Combines with AC Caswell -WR from the Oakland Raiders and other core pro players to measure the skills and the abilities for the athletic requirements. July 2014 - 2 Pro Scouts that will be looking for players with talent for the following Pro Leagues: NFL, AFL, CFL, and the Developmental League of NFL. "The One Source Of Football Developmental Programs In The Caribbean"
Disclaimer: Content presented on the American Football in Costa Rica website is intended solely for informational purposes and carries no express or implied warranties. The content of this website has been prepared by the webmaster representing the sport of American Football in Costa Rica. The information, and any opinions herein based upon, has been obtained from sources believed to be reliable, but which may not have been independently verified, and no guarantees, representations or warranties are made as to its accuracy, completeness or suitability for any purpose. Ms Elle, webmaster. Webmaster content copyright 2012-2015. All rights reserved.